It is an exciting time in the BASIS Independent Fremont drama classes as students explore the topic of community. Students are engaging in rich discussions that investigate how the performing arts plays a role in building community connections inside and outside of the school walls. All the students who participate in drama classes have written an original class play to share with our school community at Winter Arts Gala. 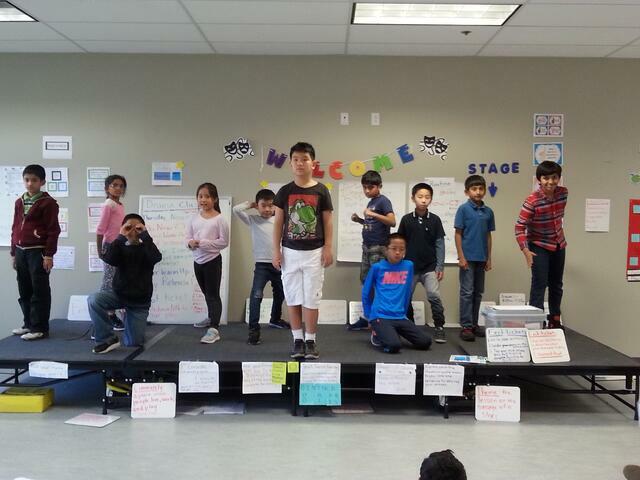 In fourth grade, the students have diligently worked on creating an original class play. This imaginative project began by students brainstorming a script topic in pairs. Students were invited to brainstorm a real world issue or problem faced by our community. As students “shared out” their ideas, the conversation began to blossom into what problems our world may face. Students were concerned about global warming and specifically the polar ice caps melting. And thus, a topic for the class play was born! Students transformed into playwrights as they constructed creative dialogue through group improvisation and writing activities. As students participated in the playwriting process, they learned how to artfully collaborate to create one original class script. It was amazing to witness the students sharing and adding on to one another’s ideas as the script took shape. The playwriting session is now complete and students are all the actors in their very own play! It is lovely to see the students take ownership of their play and invest in becoming their character roles. The students are inventing such creative voices and body movements for their characters! Student’s creativity is continuing to shine forth as they work to create sound effects, props, and small costume pieces. Shayaan came up to me at the end of class yesterday with an awesome blue print of how to build a time machine for our play! It is so amazing to be a part of such a wonderful community of learners!